Many people, especially in America, are under the mistaken impression that communism is a dead issue in the world today. 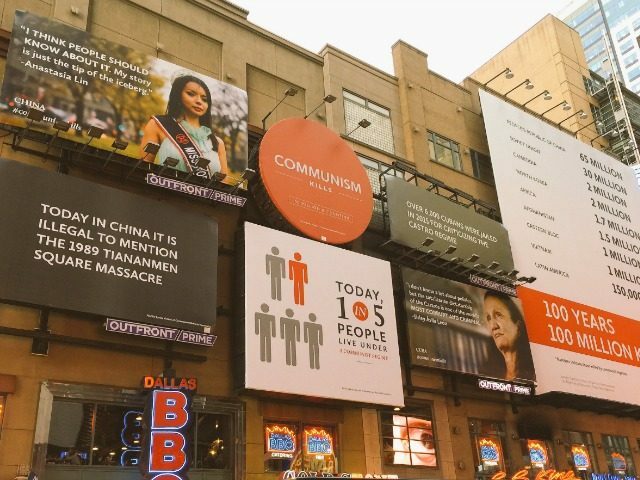 But the folks at Victims of Communism Memorial Foundation want to remind us all that one in five human beings still live under this oppressive system and they have just launched a billboard campaign in New York’s Times Square to do just that. The group launched the campaign because they believe people need to re-awaken to the dangers of this inhuman system as well as its destructive legacy. Victims of Communism Memorial Foundation also hopes to point out that support for communism is once again spreading across the world especially among people in colleges and universities right here in the U.S. The Victims of Communism Memorial Foundation is a Washington-based, non-profit educational and human rights organization devoted to commemorating the more than 100 million victims of communism around the world and to the freedom of those still living under totalitarian regimes. Recently VOC has announced its efforts to launch an international museum on communism in Washington in 2017.